If our weekly gathering is the ultimate party, our seniors are the ultimate party hosts. Our core group of seniors is constantly bringing their friends and siblings to join our class – and I mean that literally! I’ll never forget the moment several weeks ago when I saw Bernice proudly walk in with her cane in one hand, and Mr. Gordon in her other arm (who is blind and also has a cane of his own). Mr. Gordon has become a regular member since. At the same time, volunteers from our team have emerged from behind the scenes, and are frequently taking time out of their busy days to be at class as well. Besides working on this project as a volunteer, Jill is an assistant professor at Temple’s School of Social Work. I feel so fortunate to have her on the team and to be learning from her expertise about the more clinical/therapeutic aspects of our project (stay tuned for more on this in future blog posts). Below are Jill’s reflections on her visit this week, as well as her transcriptions of two of the seniors’ verbally told stories. Today I visited the creative writing group at the Philadelphia Senior Center to observe and help with the project. Not only was I welcomed into the group, but was embraced by their contagious spirit. I heard beautiful stories of personal growth, reflections about parental love, and heartbreak associated with loss. The experience was moving—at times, I was moved to cry and at others, I was filled with joy. I feel fortunate to be involved in such a wonderful project. I was daddy’s little girl and I knew it. My daddy would give my anything that I wanted. Sometimes I’d tell lies on my brothers and sisters. Then I’d laugh, and say “ha ha, you got a beating.” I did this to get ice cream. My daddy died when I was five years old and that was the last time that I had ice cream. It took me a while to cry it out. Now I don’t have my mom or my dad, but my mom always prayed for me and never turned her back on me. I’m living like I’m supposed to now. Back in the 1960s or the 1970s when racial discrimination was a big problem and the Civil Rights were in full swing, I was working for the American Friends Association. We mostly worked with young people. We tried to address the gang activity and we did things like play basketball, sewing classes, teach pregnancy prevention and things like that. One thing in particular was this weekend work camp where we’d bring suburban youth so they could experience the inner city and spend the day with an African American so we could start a conversation. It really troubled us as men that suburban youth only saw the worst parts of African American communities; they only knew what they saw on the news and that were just one side of the story. This started a good conversation about race and how people are different. It helped us to talk about how you can’t believe everything that you see on TV. This program helped people in the city get a perspective on the suburbs. Suburban kids got a perspective on the inner city and the chance to meet African Americans who aren’t involved in gangs and aren’t shiftless or lazy. 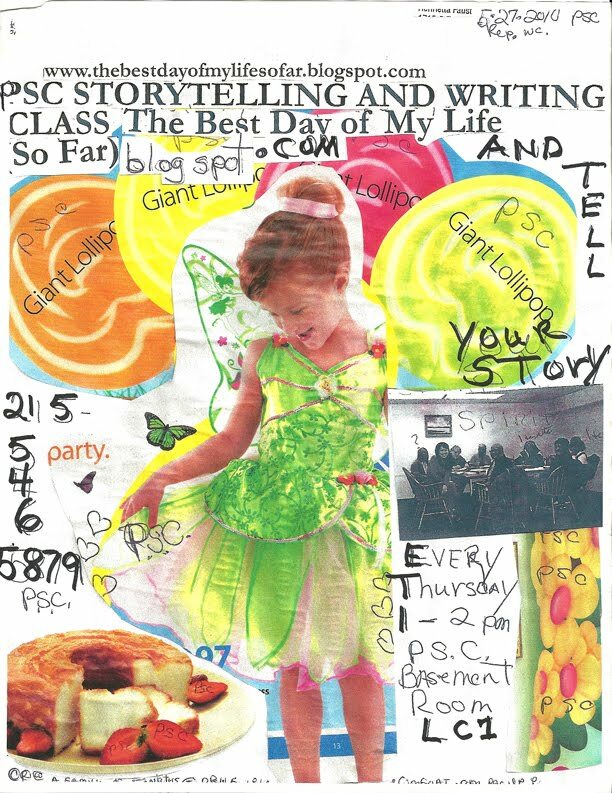 You gotta check out this beautiful flier that Henrietta made! I love this. Just got this today and have to show you right away. She turns in a full stack of pages every week (today's page count: 13) and once in a while, they include collages. Don't you just love the the little hearts and butterflies and giant lollipops? And how she says, TELL... YOUR STORY? And the word "party"? I guess seeing this just makes me so happy because here we are, in name a writing class, but in spirit, simply an outrageously good time. And btw, yes, the seniors are pysched about our Leeway Grant. Today, when I broke the great news to them, they immediately SUGGESTED bringing teens into our project and incorporating video just as I was about to propose the exact same thing. Yay! Recently Henrietta wrote an open letter asking you what you’d like to hear about, and you responded via Facebook! Well, surprise surprise… you got what you asked for. Check out Henrietta’s response back to you. How cool is this? And how surreal? It’s a conversation that takes a little longer than face-to-face, no doubt. But it’s a conversation nonetheless. The seniors really are getting a kick out of Facebook. Every class, we check if there are new comments and read them out loud. So comment away! Ask and they will answer. I received your requests and will write about my mistakes in life. Be it known I’ve learned that some mistakes are a resource that teaches me new lessons, because these sources all work together for good. And I shall write of my successes, which I define as a constant arriving at the next level, all life long. In each moment, I am correctly able to handle the new success. And I will write about complications that I experienced in life. And little things I kept in my life through the years. I shall start will a little story about my pet dog named “Bully”, the bulldog mix. Plus – and I was so glad to hear from you via Teacher Cooper, that you said, “I enjoy your blog so very much.” Please keep reading. So soon after that our female dog came home, dragging her tail low. And, she went under the house and stayed and stayed until one day we hear puppies crying. Story about pet Bully the Bulldog pet cont. We heard puppies crying under the house. We were surprised and someone crawled under the house. And there they were a littler of bulldog pups. The children were thrilled and surprised but a look of absolute. Fear was on my Aunt’s face. I was wondering why? But I know we were poor so that must be why so much fear was on my Aunts face. So when one of the children were thinking which puppy was theirs, but not so fast. At that moment the slave master rolled up his gleaming bright car. Now that I've calmed down a little bit (just a little! ), let's get right back to the seniors' fabulous stories. And speaking of theater, here's Helen talking about how much fun she recently had at "The Lion King". I wish you could've all seen her face when she read this story out loud. Her eyes were absolutely glistening the whole time. This story will put a smile on your face. I'm guaranteeing that right now! You can imagine how surprised I was. I asked my friend who was sitting at the table to tell my daughter where I was when she came to pick me up at 3:30. She assured me that she would do so. I walked out of the dining room into the lounge where I waited for the other lady who was going to the theatre. When she came, we walked out of the building. At first we were going to walk the three blocks, but looking at our watches we realized that we would be late if we did so. We soon decided to flag down a cab. One came by immediately. When we entered the theatre, two young ushers approached us. The young man took my arm and escorted me down the aisle, and the young adult usher escorted my acquaintance. Our seats were choice ones – on the third row from the stage! Can you believe that? One hundred and fifty dollar seats! Well, we settled back in our seats and the show began. The sound effects, costumes, dancing, singing, and the colors were superb! Oh, yes, I forgot to mention the acting, need I say more? The story of The Lion King was very good and had a happy ending, which I like (smiles). Afterwards, we returned to the Center, where my daughter was waiting in the car. I can only say that this was an unusual experience that I shall never forget. YES YES YES! WE GOT OUR VERY FIRST GRANT: THE LEEWAY FOUNDATION ART AND CHANGE GRANT!!! TO HOST A SENIORS STORYTELLING DAY!!!!! SORRY ABOUT THE ALL CAPS BUT I’M HAVING SERIOUS TROUBLE CONTAINING MY EXCITEMENT!!!!!!!! This grant – whose objective is to support art projects for social change – is pretty competitive and I am still in shock that we won. As you know, our project began only months ago with two core media: the classroom and the web. With the Leeway grant, we can now add two new components to our multi-media storytelling project: performance and video. Seniors Storytelling Day will be an event, happening at the end of this year in a public venue in Philadelphia, where teens and seniors will get up on stage together, to tell the seniors’ stories to a physical audience. During the months leading up to the event, the teens and seniors will collaborate closely, and the teens will document the process in writing and video, so that this event is not only about one day of stories but also half a year of the teens’ and seniors’ personal transformations. I can't even tell you how pumped I feel about all this. Even before starting this entire storytelling project, it has honestly always been my personal dream to connect seniors with teens (two groups who are often misrepresented by society) and give them a chance to empower one another in a way that we as observers may not know how. Thank YOU Emily for everything you're doing for this project, and for letting me post your powerful email here. I can't tell you how much your passion means to me - and the effect you have on our teammates is apparent. By the way, readers, stick with us. LOADS are happening on this project behind the scenes. I truly believe that this project is nothing short of a series of miracles. We're still ironing the details so I can't reveal everything quite yet. But what I can say is every dream my volunteers and I have ever had is coming true: satellite classes and blogs, check; video branch, check; teen outreach, check; a public seniors storytelling event, check. Seriously, stick with us. The next few weeks and months will be full of some unbelievable announcements. Just wanted to say that I really love what you wrote in the blog about building friendships. It actually made me reflect a little bit on my grandfather, my relationship to him, and the relationships he kept until he passed away, which didn't extend much beyond his immediate family. My grandfather was a diabetic, a survivor of two heart attacks in the 1970s, and a very ornery old man (but a big softy underneath - especially for his granddaughter!) By the time he moved to Charlotte in the 1990s, he wasn't in the best shape. In fact, in his last few years, my mom said that doctors would look at his charts and proclaim, "On paper, this man should be dead!". Until reading your essay today, I hadn't thought much about what was keeping him alive for all of his 89 - almost 90 - years. Sure, it was his fiery spirit, but I think more than that it was debate. My grandfather would counter just about anything anyone would say, playing devil's advocate. Sometimes I couldn't tell if he truly believed what he was saying, or if he was trying to get me to think. To be honest, I think he liked the sport of it, the way debate kept his mind sharp and helped bring interest to his relationships. My grandfather was fiercely independent. When he stopped being able to drive and have daily interaction, his health started to deteriorate more quickly. I think the idea of going into an assisted living facility, for him, was the kiss of death. I remember once visiting a nursing home where he was staying temporarily and being completely terrified; most of the residents I saw in the halls were completely listless, without response when you walked by. Upon reaching my grandfather's room, I felt much better. There he was, stubborn and complaining as always (but maybe it was because he knew his stint there was only temporary). Anyways, this wasn't meant to be a depressing story, but that seems like what it is turning into. There were a lot of funny and quirky things my Gramps and I did together that I will have to share when I make it to the class sometime. The real thing I wanted to say to you in writing this e-mail is: Thank you. Visiting nursing homes I've been to always makes me sad. For some, they seem like places to dump older relatives that begin to need extra care. Maybe I have just been to a few that do not have strong social networks, but I think of what a difference human contact, and friendships, can make in a persons quality of life. I know that a spark was ignited every time I visited my grandfather. My dad said one of the last conversations he had with his dad was a debate about football. You really are giving a generation a voice that is oftentimes forgotten, something to look forward to every week, and a breath of fresh air. You are also giving younger generations new ideas of questions to ask, and in terms of me at least, new things to reflect on. Bravo! Feeling a little reflective since tonight I will be sitting on a panel for a public event called "Arts for All Ages" to talk about the mega picture of this project. Nervous too. 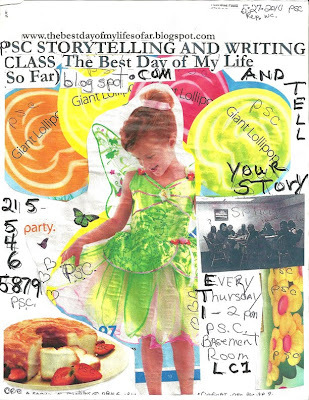 Because this project began pixel by pixel, literally, word by word on the page and then on the screen, and it's daunting to step back and have to give names and descriptions to the intertwined relationships connecting seniors, their families, volunteers, blogreaders. Well, there is only one thing to do, draw on what the seniors say about the class and what the class means to them. We had a discussion about this last month but I've been waiting for the right time to post them on the blog. Looks like today is the day. We are the generation of today. Our kids and grandkids are the grandkids are the generation of tomorrow. What we do today will affect them tomorrow. I am so glad I came to this class. When I first saw that title in our newsletter (advertising a newly formed writing class), I thought, I’ll just go and find out what that class was all about. If it was boring, I wouldn’t return. Actually, I totally expected this to happen – but it didn’t! As I sat in the class, I listened to the readings and excitement of both the participants and our chairperson. And, how very interesting their writings were. I became as excited as they were. Needless to say, I’ve been coming to the class ever since - I wouldn’t miss it for the world! 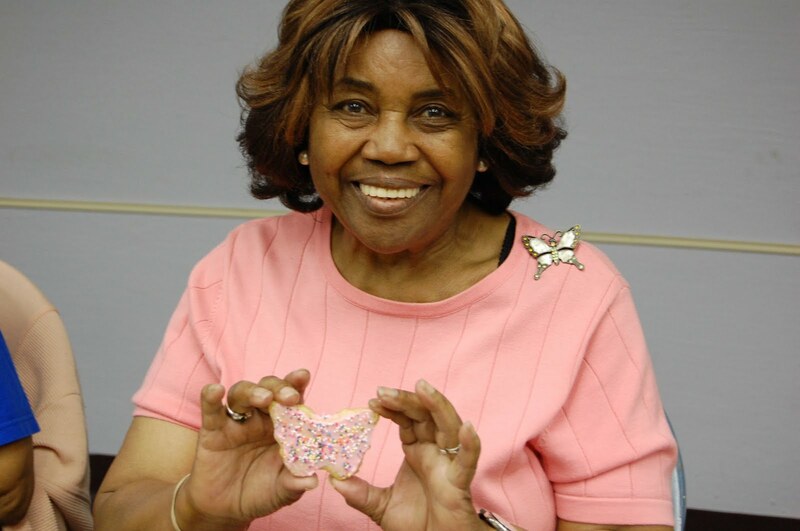 Benita Cooper has been our teacher for the Philadelphia Senior Center Writing Workshop since September of 2009. It has been amazing how she throws out a subject to us and we start to put down on paper a store house of memories. We get a chance to share with a small group of very interesting people, things that have been locked in our memory “boxes” for many years. Benita, a beautiful young lady, full of energy, shows an interest in all of our stories and has even created a website for us. This helps our family members and others to share with us as we journey. Mrs. Cooper (Benita) has endeared us to her as she shares her love for her own grandmother. For about an hour or so on Thursday afternoons, we share a delightful time … hanging with Mrs. Cooper. I am remembering a conversation I had a couple of weeks ago, when my husband and I went to Seattle to surprise my grandma and family for my grandma’s 89th birthday. My grandma! The very inspiration of this entire project! (Check out the blog sidebar to read more.) And one night, she and I got on the class’ Facebook page to see photos of the group. She asked me one question and gave me two pieces of advice. I am realizing something. The stories written and told in our class are amazing, no doubt about it. But the stories are just the icebreaker. What this project is actually crafting is friendships. That is the real art of this intricate, collaborative work-in-progress. Let’s do one more scary story. I won’t give it away but the second to the last sentence makes me want to scream! Gosh, the slip in her hand, the railroad tracks and the bay, her ten-year-old legs… talk about vivid details. This is how you know (1) she was REALLY scared and (2) she really loves to write. I am so glad she is in this class. People talk about kids and teens having potential, but to me, seniors have potential too. I can’t wait to keep seeing Hazel’s stories. That lady can work that pen. Mom had always dealt with this main large plant located on the outskirts of town. First, it was in walking distance and secondly, more reasonable prices were available. Located between the railroad tracks and the bay in a deserted area, the plant was finally in view as I trudged along. When I approached the building a huge white, black and yellow collie barked and lunged towards me. I screamed “Mama, Mama,” spun around on my ten-year-old legs and scurried in reverse. Just as his breath was felt on my legs he decided to return to his base as a watch dog. Arriving home safely after this atrocious fright renewed my faith. If I were to make a list about things that astound me about this project (actually, I should do that one of these days, shouldn’t I?) somewhere at the top would be how incredible my volunteer team is. Here are a few more words from Amy about her experience on the project and also a story she wrote, when she came to class a couple weeks ago. As a reluctant, up and coming senior citizen I decided to start involving myself with the senior center in Philadelphia. I chose volunteer work as one of the things to continue to do in my life and found myself on the editing end of a project you may know as "The Best Day of My Life So Far". After establishing myself in the area of editing and assisting where I can, it came to my attention that I actually had met some of the folks whose stories you read. Since I don't frequent the senior center and have been out of touch with those folks, I decided to show up for a writing session. I was so inspired by this process and these great writers that I decided to submit my own little story. I hope I can submit others in the near future. Enjoy. As often happened in our family, a family trip started out in our old jalopy. There were probably 7 kids in the family at this point and all but the baby went onto the back seat. There were no seat belts in those days so often one of us was allowed to sit on the backseat floor on the hump. Right before we pulled off, I told my mom something seemed a little strange, maybe someone was missing. She didn’t think so and shortly thereafter dad started to pull away. As the car moved ahead I realized that there was a silhouette in the bathroom window. Suddenly, the car stopped and everyone looked up to see an anxiety filled sister staring back at us. Well well well, as a petite woman who is a little bit of a kickboxing fanatic (oh yes!) I gotta say, you go, Bobby! That a boy! By fifth grade there were three of us tied for the smallest boy in the class. Tommy Murphy was as short as Bobby Neely and I but he was huskier and weighed more. That was most important in most playground games and sports. Neely’s older brother Eddy came home from World War II on leave. He taught Bobby Ju Jitsu. That was bad news for the bigger and or older bullies in the “brick row,” (our neighborhood), school or the playground. Bobby would speak slowly and softly to the bully asking him to stop hitting or pushing our friends. The bully would usually laugh at or insult “Neely” who would quickly grab their fingers and/or wrist and force them to the ground. Bobby would tell them to apologize and leave. They always did. Neely didn’t grow very tall but he just got tougher and tougher with a great sense of humor. He was a great friend all through my childhood. Keith – this one goes out to you. In class on Thursday, your mom Hattie told us that you recently checked out the blog looking for what she has written about you. She did write more than I have been able to post on this blog. Sorry!! As stories are mounting in class, they are rapidly outgrowing the weekly slots on the blog… so sometimes it takes a little longer for some stories to get posted. But here you are, this one is about you smiling your sweetest little smile on your first day of school. It really shows how much she loves you. I think you might like this one. When I took Karen to school the first day of kindergarten, she went in crying and did not want to stay. After she settled down and I left her, I cried also. I felt like I had abandoned her. When I look Kevin for his first day of school, five years later, he stretched out and refused to stay. I cried when I returned home that day with Kevin, wondering if this child would ever be educated. Two years later, when I took Keith for his first day of school, he waited for the bell to ring. I waited for the tears to start and the drama to begin. Keith got in his line, the bell rang, smiled his sweetest little smile and waved his little hand and disappeared into that big, gray building. I felt like the teacher would kidnap him, he was so cute and friendly. I went home and wept bitterly. Sifting through my computer folders to retrieve fabulous stories (and experiences) from previous months that haven’t made it yet on to the blog. Every week we have about 10 stories/poems (20+handwritten pages!) plus my memory of the particular class to fit into 3 or 4 posts per week… it’s a tough math problem! I feel bad I can never get enough out to you guys soon enough. But my volunteers and I are dutifully typing every story and poem up, I promise. No written story goes forgotten! Suppose I ask you, How are you? To wear? Do you have stress, depression? What was your childhood like? Any hatred? Parents? Siblings or deep traumas? Healing deep trauma just ask. I had been visiting my parents for the day, and my daughter was at work. My two sons were at work and lived elsewhere with their families. Although I was happy for them (my daughters-in-law are nice young women and I am fortunate that they like me), I couldn’t help feeling twinges of sadness at times when I thought of the days when my husband and I had them laughing close to our legs; or when they would jump into bed and snuggle up to us. Oh, well let me get back to my recollections. Before I knew it, it was time for Diedre to pick me up. Soon, we were on our way to our home. Upon entering the house my daughter ran up the stairs to her bedroom. She let out a squeal and burst into laughter. “Mommy, Mommy, come up here,” she called. Then I entered the room, I too, burst out with laughter. You see, my daughter had held on to some of her cherished dolls. Raggedy Ann and Andy were always propped up by her ruffled pillows, but, today (along with other dolls and stuffed animals) were standing on their heads. Only one person was guilty of doing this- her younger brother. At times he came into the city for a business appointment. He would either come by later and I would prepare lunch for the two of us, or he would take me to lunch. Today, however, he felt in the mood to tease his “little sister.” It wasn’t difficult for us to picture him tipping around her room, disturbing the little people. I smiled as I watched her go to the telephone and call him. I could picture him watching by the telephone. Following a laugh-out-loud blog post, I thought this one is only appropriate! The irony is – and I don’t know if you feel the same way – even though the topic of this piece is laughter, and the words it is made up of are so basic, it hits me deep inside. Without laughter where would we be? You have to laugh sometimes. There are sad times; there are good times. When we have good times we laugh. When we have bad times we cry. When we lose a loved one it is very sad. We are only with each other for a little while. That’s why when we are here we should help and love one another. Did a couple of more serious stories earlier this week. So… ready for a laugh? You can't not laugh at this - it's the cutest. Best part about this story is, the way Hazel teases her great-granddaughter, somehow, embodies so much love. I hope her great-granddaughter gets to read this story when she grows up.